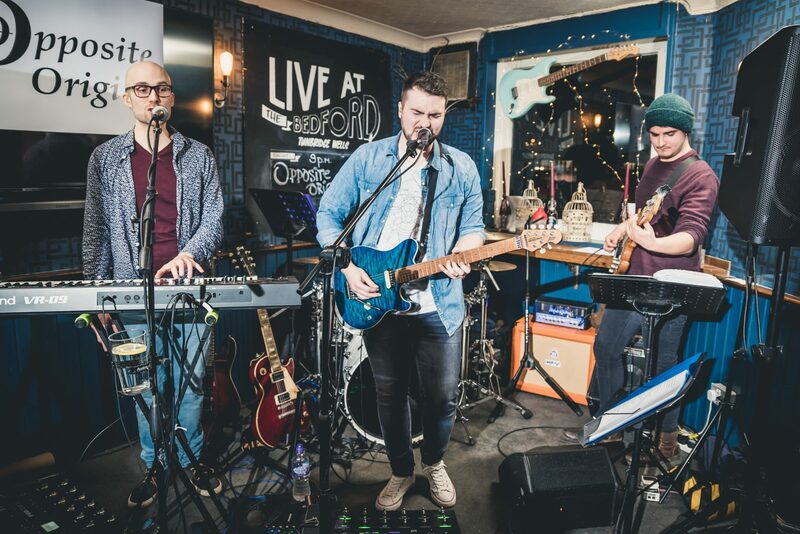 Opposite Origins are a four-piece band influenced mainly by alternative, indie and progressive rock such as Biffy Clyro, Muse, Radiohead, Arctic Monkeys, Foo Fighters, Coldplay and The Killers. Drawn as much to uncomplicated songwriting as they are to musical pyrotechnics, Opposite Origins balance ambitious covers alongside stadium-rousing anthems. Regulars on the playlist include Muse’s synth-laden odyssey “Knights of Cydonia”, The Darkness’s “I Believe in a Thing Called Love“, Coldplay’s uplifting ballad “Fix You”, and Oasis’s “Don’t Look Back In Anger“. Despite growing up only a few miles apart, frontman Ryan and guitarist/keyboardist Bill met back in 2010 at a Maidstone jam night (The Old House At Home). Finding immediately that their music collections shared many of the same favourites, Ryan and Bill have since built a steady roster of covers, gigging at pubs and for private bookings around the South-East of England. Opposite Origins also features Will Luchford on bass, and Ric Elsworth on drums. Available to book for occasions such as a wedding, birthday party, anniversary, or corporate event, Opposite Origins will bring the rock music you need to elevate the atmosphere. Please use our contact page to get in touch and tell us what you’re looking for. We can also provide a duo format, suitable for intimate venues and house parties. For more information, see Acoustic Atlas.